Dump Truck Web App Updated with Thumbnail view! Golden Frog added support for thumbnail view in the Dump Truck Web App! 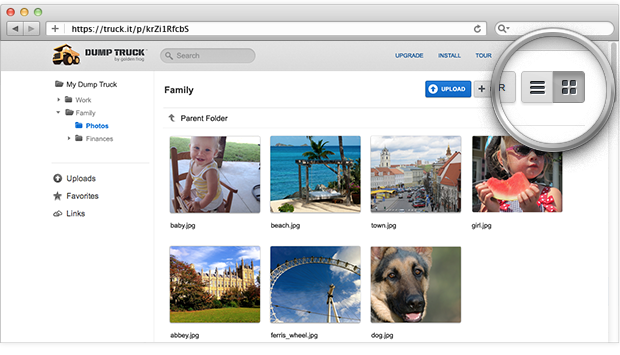 The new thumbnail view makes viewing your photos fast and easy. To activate the thumbnail view, simply click the toggle at the top right of the Web App interface to toggle between list and thumbnail view. You can access all the standard file actions —favoriting, deleting, renaming and drag & drop— while in thumbnail view! Log in and start using thumbnail view! New VyprVPN server cluster in Bucharest, Romania! Golden Frog added another new VyprVPN server cluster - this time in Bucharest, Romania! Please also check out the VyprVPN Desktop and Mobile apps – they make it easy to protect your Internet connection with a single click or tap. You can immediately take advantage of the new Romanian server cluster. The Romanian server is available for all VyprVPN protocols, including PPTP, L2TP/IPsec and OpenVPN. If you use VyprVPN Desktop, the new Romanian VPN server cluster is automatically available when choosing your server location. To choose the Romanian VPN server cluster using VyprVPN Mobile, simply log out of your mobile app and log back in. Golden Frog recently added a Luxembourg VPN server, a Russian VPN server, a Swiss VPN server, a Sweden VPN server and a Denmark VPN server. Golden Frog will continue to add additional VPN server clusters throughout 2013 - so stay tuned!